In Piddington, as in countless other rural communities, many of the amenities that maintain village life have gradually disappeared – school, shop, post office, pub. 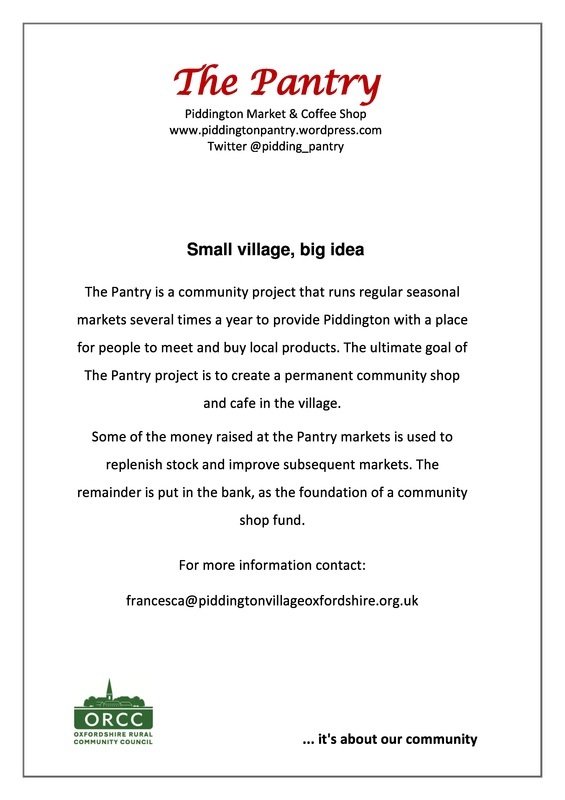 The Pantry (Piddington Market & Coffee Shop) is a community project to provide the village with a place to meet and to buy locally made and locally sourced products. Our aim is to hold regular seasonal markets throughout the year. Each market will be a unique event based on the products we have sourced and the stallholders attending on the day. We held our first market in December 2012, which was a great success and encouraged us to set dates for four subsequent markets in 2013. In February 2013, as part of the Government’s Big Society initiative, Oxfordshire County Councillor Mrs Catherine Fulljames awarded £1,000 from her Community Budget to The Pantry because of its worth to our community. Our original aim was to promote small local businesses and fundraise for a shop in Piddington. However, after village consultation, it was apparent that the latter aim lacked real viability. Nevertheless, the group believed that other village causes could be helped, and in the years since its launch we have made substantial donations to Piddington projects. However, holding regular markets is not only an important first step towards this goal, but also makes a big difference to the community life of the village. Check The Pantry blog for news about future events. Of course, the success of The Pantry depends on the help of a large group of volunteers - not to mention the support of the stallholders and the people who come to browse, enjoy the coffee shop and buy some goodies. But the people listed below are the ones who got together originally to investigate the possibility of starting a community shop in Piddington. As a result of initial discussions, the group decided to organise a regular seasonal community market - The Pantry - as a first venture. You can contact any one of us about any aspect of the market, as we share responsibility for the organisation and running of The Pantry. However, each of us has taken on some particular tasks on a day-to-day basis, and these are shown beside each name. Getting The Pantry up and running is no small undertaking, and the success of each one depends on the efforts of a number of people who have volunteered to help with various jobs that need doing. We now have a gratifyingly large group of people we can call on to help, but we can always do with more. Our volunteers turn their hand to many things – e.g. setting up the stalls and marquee beforehand, baking for the coffee shop, serving behind the counter or on the General Store, clearing away afterwards. People really seem to enjoy volunteering at the market, and their friendly enthusiasm helps to make it such an enjoyable event. If you’d like to join our volunteers, please email Maggie. 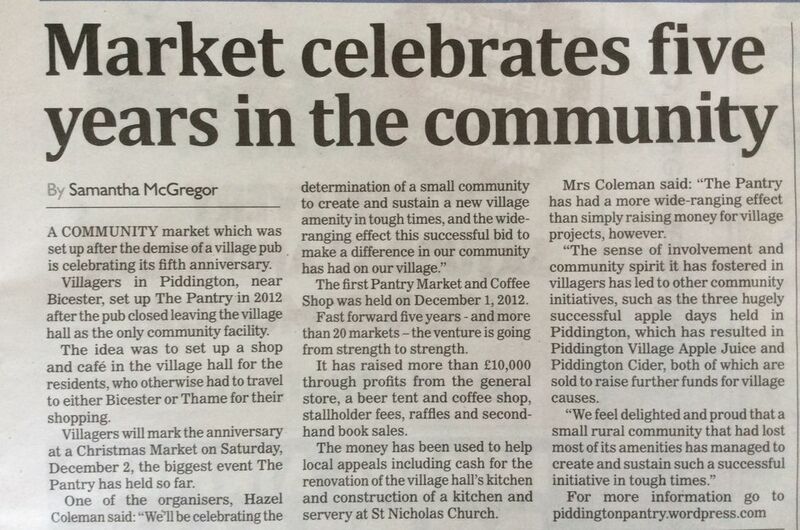 The Pantry Christmas Market to be held on Saturday 2nd December in Piddington, a small village near Bicester, will mark the 5th anniversary of this successful venture, and will be our biggest so far. We’ll be celebrating the determination of a small community to create and sustain a new village amenity in tough times, and the wide-ranging effect this successful bid to make a difference in our community has had on our village. The first Pantry Market and Coffee Shop was held in the village hall at Piddington, a small community near Bicester, on Saturday 1st December 2012. In an article published in the Bicester Advertiser (29th November 2012) Francesca Darby, one of the organisers, stated that “The intention is to make the market a regular feature … the hope being that this will eventually become a source of funding … and achieve greater local awareness for the plight of small villages.” At the time, the village had just lost its pub. Fast forward five years (and over 20 markets) and we are still going strong, the organising group and fantastic volunteers still include the same faces and our stall holders continue to give their support. Our original aim was to promote small local businesses and fundraise for a village shop. However, after village consultation, it was apparent that the latter aim lacked real viability. Nevertheless, the group believed that other village causes could be helped. The Pantry has so far raised over £10,000, generated by profits from the general store, beer tent and coffee shop, stallholder fees, raffles and secondhand book sales. At each market, we have offered a free table to St Nicholas Church, where volunteers sell homemade cakes to raise funds for essential work on the building. 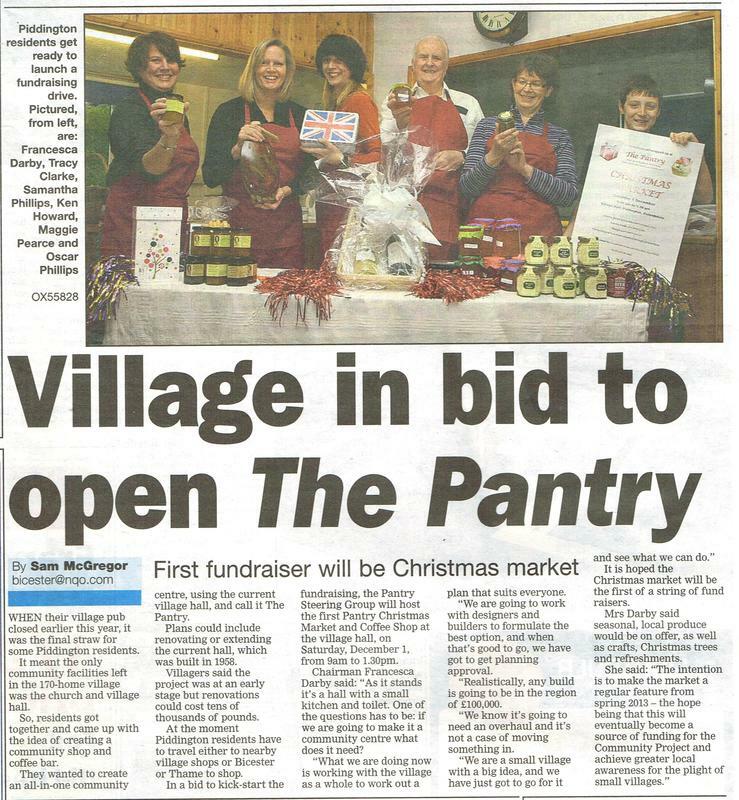 This summer The Pantry offered a donation of £3000 each to the committee of the village hall, towards the renovation of its kitchen, and to St Nicholas Church project group, for their plans to construct a kitchen/servery. We hope that by this time next year one if not both projects will be completed. We feel delighted and proud that a small rural community that had lost most of its amenities has managed to create and sustain such a successful initiative in tough times. The market exists through community patronage. While The Pantry blog (piddingtonpantry.wordpress.com) has a worldwide following, it is our visitors who create the special atmosphere on the day. The Christmas Pantry will be held on SATURDAY 2nd DECEMBER, 10am to 2pm, in the village hall, Piddington, OX25 1PU, and will mark our fifth anniversary. It is due to be the biggest yet. Put the date in the diary and tell your friends! In the meantime, thank you for your continued support.